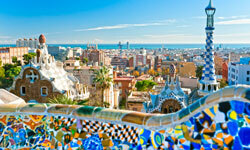 Earn up to 15 credits through a wide variety of courses when you study with AIFS in Barcelona, Spain. You may choose to live in a student apartment, or select a homestay or the student residence for an additional fee. You’ll enjoy activities like guided city walks, Spanish cooking classes & traditional Spanish music and dance. Trips include Gerona and Besalu, Figueras and the Dali Museum, Montserrat and Sitges, and 3 days in the Pyrenees. Optional trips include 3 days in Morocco & a 3-day trip to Seville & Granada.